From airport International Airport Bologna Guglielmo Marconi 11 Km. From city center 0 Km. From public means 200 Mt. The owner family, originally from the island of Cyprus from where their name comes from, moved to Bologna at the beginning of the eighteenth century and over the following centuries became one of the city’s most influential senatorial families. The owners borned as a family of merchants, in particulary they traded the silk; than, in the Renaissance, they acquired the title of justice of gonfalonier and thanks to Papa Leone X, that of Senators (1505). With their influence also grew wealth and possessions, so the original merchant house in Strada Maggiore, dating back to 1210, was added to the Palace, in whose rooms you can admire the portraits of the family of the famous King of Naples Gioacchino Murat, with whom they became related in the early nineteenth century. Meeting rooms The Palazzo's center Congress has 9 meeting rooms which 8 are at the ground floor with natural light and the last one at the basement. The capacity change from 10 to 130 people with an orchestra disposition. The restaurant The restaurant followings customer requests. 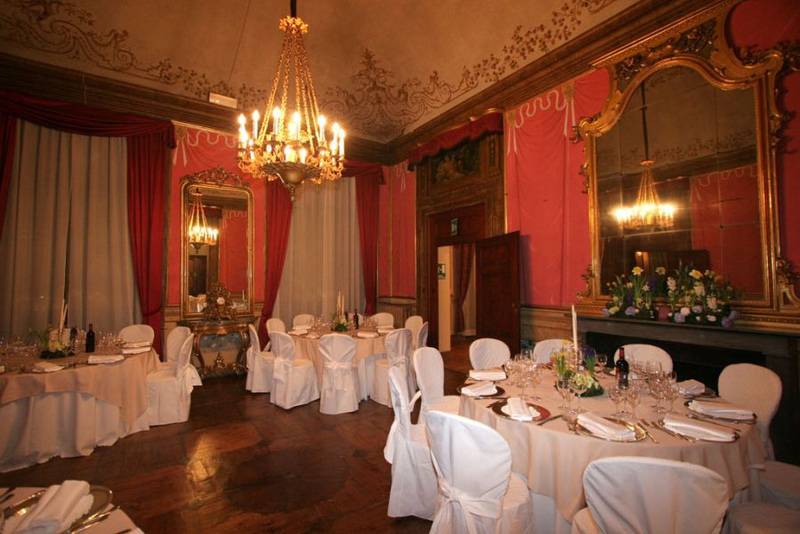 The Palazzo works with excellent catering companies, which organize the equipment and meals. On the ground floor, in the Court, is located a restaurant of regional approach.